Stairs in one corner of the Operations Room led down to a basement containing the Kelvin Hughes Photographic Display Units and an associated darkroom. The PDU was required to apply a six foot diameter image of a PPI radar display to the underside of the translucent Plotting Table, and it achieved this in the following manner. An integral seven inch CRT with a bluish/whitish phosphor provided a very bright PPI display and this was photographed onto HP3 35mm continuous film via an f2 lens with a fifteen second exposure i.e. once per revolution of the trace. Range rings and Video Map could be switched on if required. During a seven degree segment of rotation over north, the exposed frame moved on into the processing chamber where it was sprayed with developer. After a brief interval it was sprayed with water and then with fixer. A final water spraying took place and then it was blown with hot air. Each stage took fifteen seconds and a minute after the start of the initial exposure the frame moved into the projection station. All the necessary mechanism is in the compact unit shown here, the CRT being mounted vertically below it behind the front door. The demijohn size bottles of chemicals and water were mounted upsidedown and accessed from the side door. An additional cabinet contained power supplies, control equipment and the compressed air source. A one kilowatt argon lamp projected the image via an f2 lens onto the first mirror and via the larger second mirror on to the undersurface of the Plotting Table in the room above. The first mirror is the circular object above the mechanism. Two PDUs were provided, left-hand and right-hand, both projecting towards the final larger mirror mounted on a frame between them. By manually flipping this over, the image from either PDU could be directed upwards. 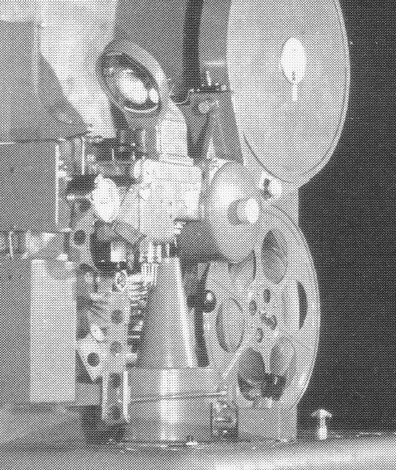 The film in the PDU was a 1000 foot reel loaded in a cassette by the fitter or mechanic in the darkroom. This was sufficient for 24 hours but when the film was about fifty feet from its end, a buzzer in the Radar Office called for attention, as did low levels of water, developer or fixer. The drill was to then switch on the off-duty PDU and after a minute flip over the double-sided final mirror to allow the newly activated machine to provide the image. The first machine could then be serviced without haste. An additional facility provided by the PDU system was that the used film could be archived and used for post-mortem purposes after any event such as mid-air near collisions. The disadvantage of the system was that the overall picture on the plotting table was a minute behind real-time, but the viewing officer always moved to a normal console at a time of particular interest or impending crisis. At Ventnor my colleague Graham Bowden became quite an expert at divining the ills of these machines. In particular he remembers a problem with EHT arcing and he traced this to a fault concerning the aquadag coating on the CRTs, seemingly a manufacturing fault. However the cause was not an absence of aquadag, but the absence of a connection between that and an earthing pin. So the charge from the electron-beam instead of being drained away just accumulated on the surface of the CRT tube building up until it discharged like lightning. This arcing rendered the PDU useless. A new batch of CRT tubes was ordered, and the problem vanished. Graham believes that it should be possible to verify all this from RAF records. 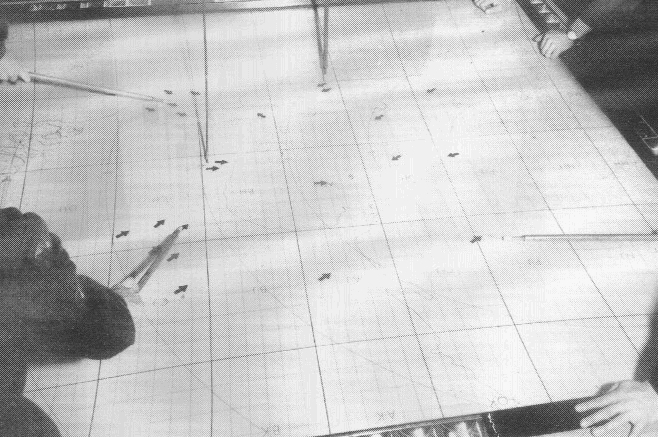 This picture of a PDU plotting table shows metal arrows manually placed to emphasise friendly or enemy targets of particular interest although the actual radar echoes are not clear here due to the relatively low contrast provided by this system. The origin of the trace has been moved well off centre to give greater coverage of the area of action. The curved lines are the range rings and the video map sourced grid system is clearly evident together with some video map coastal outline discernable upper left. I must thank Bob Jenner for the provision of the above photographs and for the source text from which the majority of this account was derived. Alf Fisher, the curator of the RAF Signals Museum tells us that a smaller version of the PDU was made for shipboard use. It used 16mm. film, a 3" CRT and backprojected to a 24" screen. A regular minor fault was that of jet blockage which indeed was common to the larger units too. I wonder which size of machine was 'invented' first?